The Creation of a New Spirituality | "Northern Crossings"
Folks might ask why we talk about politics and the issues of the day that seem to be intractable, when this is a mercy blog that should be talking about heavenly things and things of a spiritual nature? The separation of church and state has been beaten into our heads until we react like Pavlovian dogs and keep our heads down and just stick to the “spiritual” whatever that means. The fact is that the language of faith had been coopted by politicians and others and those of certain persuasions seem to have no problem crossing the seperation of church and state issues. When issues are elucidated and policy positions are taken and announced from pulpits there is no out cry of seperation form some quarters. The cry that we hear daily is that of “double standard” and it is heard so much that we tend to agree that there is a double standard and there always has been. One glaring example happened last night and happened on the journalist integrity front which is always a fascinating area. Lately news conferences and press conferences have been shouting matches and so rude at times that one wonders if they are even worth watching. No information that is presented seems to be accepted and questions about things that were not presented are screamed at presenters. Any whiff or hint of scandal is congealed into a meme that turns questions into statements made that really need no comment and then there is an attack about there being no comment. So if the President has a news conference about the relations with the European Union about tariffs and the President of that Union is there and questions are raised and screamed about something totally different there is an attack supposedly on a “free press”. A news conference with Les Moonves the CEO of CBS which has a news division that used to be considered the greatest, is caught in a controversy that usually means a shouting match – sexual harassment. Moonves had the conference announced thusly by Adam Townsend, a company spokesman who said “the scope of today’s call and any questions will be limited to the quarterly results of the company.” And guess what? It was. No screaming of questions by female reporters on the actions and past of the CEO; no hollering or accusations, just the quiet subservience of a “free press”. The double standards are all around us; they do not need to be documented anymore, they just are. The seperation of children from parents at the border has been going on for about 10 years and there was no outrage, until now. There have been homelessness issues for years but they are never brought up unless a certain political party is in power. So why, from a theological perspective should Christian’s speak up in the political arena? Because what is happening today in nothing less than an attempt to create a new spirituality and a new vocabulary of that spirituality. It has been going on for years and we have retreated from the field because we have been fed the line that what the church is to do is ‘spiritual”. The non-concreteness of faith is given the lie by the reality of a cup of cold water and clothing for the naked, visits to the prisoner and the sick. When those concrete actions are taken over by beaurocracy, the quality of mercy suffers and the definition of mercy is adjusted. Political action becomes evangelism and protest becomes a sermon. 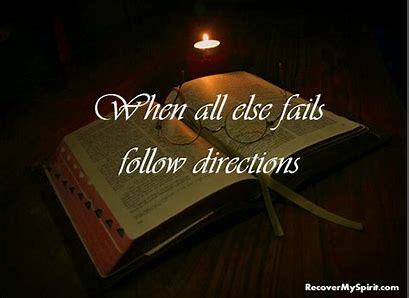 The Bible is not just and instruction book as the picture above suggests, it is the Living Word that conveys Christ and accomplishes what it sets out to do. They testify about the Christ and in so doing create a community that is mercy and justice and peace because it is incorporated into the one who through His suffering and death and resurrection is the Way and the Truth and the Life. Whatever is not Jesus is not the way or the truth of the life. Christ is all in all and that exclusive claim cannot simply be spiritualized. Or leaving the field on the political side has allowed for confusion in what mercy, grace, justice, and even mission are. It may be too late for us here, but the confusion need not be transported to the developing world who are deeply committed to Christ and Him crucified. What a Way – keep your eyes peeled.